30 hours. That's just, I just cant even imagine what that would feel like to have to wait to see him. When my son was born, he had to go to special care for 2 hours, & it was the longest 2 hours of my life. So, 30 hours just makes my heart ache on behalf of you. You are so strong, & your little family is amazing. I'm finding it hard to process so can't even comprehend what you are feeling. Your girls, your little man and your big man are so blessed to have you. 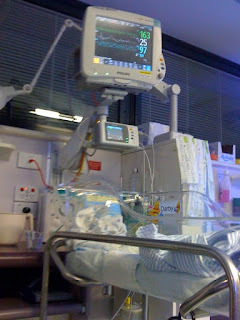 It doesn't compare, but when Magoo was hospitalised a lot as a baby I talked myself through it with the knowledge that the bond established with my baby through this trauma was going to be incredible - and it is. You will never take your beautiful boy for granted. Corinne I felt every word of this, your heartfelt writing has touched my soul. Its no wonder your BP spiked so much when all you wanted was to be with your baby and after all the trauma you had been through in meeting him so soon. And being a fellow high BP sufferer I was so scared reading those figures I am just so glad you are ok.
What can I say to provide you with comfort? Don't know why things can turn on a dime. I am glad that D is making progress and you will be home very soon with the newest member of you family. I cannot imagine what the ache of wanting to be with your baby but being unable to was like. I hope you can get him home asap & that you are starting to feel better after such a horrible ordeal. Tears in my eyes reading this Rinno.... You, C, L, L and D are all very brave souls. Of course you could have never expected this! Thanks you for sharing your story, and so happy to hear that you're home and your little man will be with you in your arms there soon. Amazing. I remember you saying that you didn't feel like packing a bag, because it wasn't happening for a while! Hope you and baby are doing well, but as a fellow pregnant mumma I'm quietly freaking out! I will put my swollen feet up and pack a bag just in case. I'm glad to hear you made it home. I hope little D gets to come home soon. Wishing good health to all in your family.